Daddy and I are sorry that we got caught up in everything that happened to JSL yesterday. We hope that you know how proud we are of you. You had an amazing week in first grade. You had real homework for the first time Monday to Thursday nights. Every day you were so sweet about coming right into the house, finishing it up quick and then reading to us later in the night. Thanks to the summer reading program, you have already read over 80 books toward your 100 for the school year. Not too shabby since you have not been back to school for a month! In addition to all of this, you had your first ever spelling word list. Each day you did a little something to get ready. You were so proud of your work. This year you color carefully, write slow and steady. . . you have come so far my big kid! The best part of everything was how confident you were about it when you went into school on Friday. You knew the ten words and three bonus ones as well. I hope this means that you will not develop test anxiety. When we got back from the ER I went right to your folder from school. 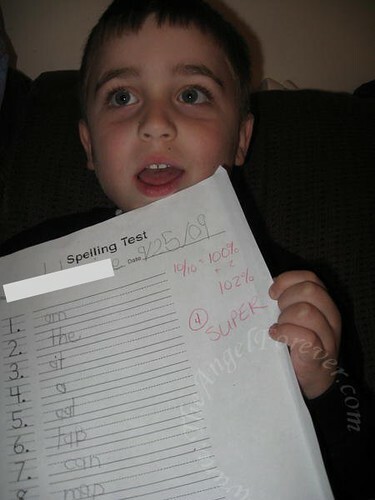 I immediately saw your paper with the "Spelling Test" label on it. Not only did you get all of the regular words correct, you also had +2 for two bonus words. Today I asked you to take a photo with your paper since I wanted to record this special day. Keep up the great work kiddo. . . we know you can do it and are so proud of you! Good job!!! I know y’all are proud! .-= Kim´s last blog ..Wild Kingdom At The House O’ Bean =-. Awww! He is a cutie! And 100%? Smart AND adorable? Looooove! :-) Hope you all are enjoying your weekend! .-= Jennifer @ It’s A Beauty Filled Life´s last blog ..Aloha Friday – Buffet =-.